HOPE YOU CAN JOIN US! IF YOU CAN'T COME FOR THE WHOLE TIME, COME UP FOR A DAY, AND PLEASE INVITE OTHERS YOU KNOW WHO MIGHT ENJOY A LITTLE GETAWAY. A retreat sponsored by Tall Timber Ranch and the Youth Leader Committee of North Puget Sound Presbytery. This event is open to any youth or children's worker and their spouses. Please feel free to invite fellow youth workers from other churches in your community. Marty is the Chancellor of Washington Seminary in Redmond, Washington. Marty is also a popular speaker, and family counselor. Marty calls himself, "a trinitarian, incarnational, paracletic, relational theologian, an ecumenical evangelical who bridges between church and academy and across the theological spectrum." He's also just a great guy with a degree in Youth Ministry, a tremendous amount of wisdom, and will be available for 1-1 talks and counseling. By now you should have heard from your liaison of the upcoming Committee on Preparation for Ministry Retreat. The theme of the retreat is Discerning God's Calling in our Lives. Rev. Denise Easter and Rev. Dianna Kunce from Renewal Ministries Northwest will lead the retreat. While there will be ample opportunity for you to meet with your cohorts in the care process, and if desired, meet with CPM for annual consultations, and even candidacy exams, the bulk of our time together will be for spiritual formation and reflection. In this way, your participation will be to deal with both the ecclesiastical needs of the care process (annual consultations etc.) and to genuinely take a few days to consider again how we may listen for God's calling in our lives. The committee is largely covering the cost of the retreat; we will pay reasonable transportation expenses. Your only cost will be a registration fee of $ 25.00. I would encourage all of you under care to participate so that you may explore new or renewed ways in which to seek and discern God's callings in your lives. The retreat will begin the morning of Monday March 5, 2012 and conclude following lunch on the 6th. If needed there will be a called presbytery meeting following the retreatfor candidacy exams. The retreat will be held at the Palisades Retreat Center in Federal Way, Washington. Sound View Camp is hosting a Youth Leader retreat from Feb 3-5th,and will be a chance for Youth Leaders, Volunteers, and Teachers to come together to share, listen, and learn from each other. During the weekend you’ll have a chance to take part in different breakout groups. Breakout discussions will be based around either a topic chosen by the group or one a particular leader is passionate and willing to lead. Please let us know if you would like to help out by either facilitating a breakout group or planning a topic of discussion. I have a friend who retired after more than thirty years as a Pipefitter. I asked how he came to pipefitting as a vocation and he looked at me puzzled. He said, “Pipefitting has been the way I have provided for myself and my family so that I’m free to pursue my vocation as a Christian.” Then he told me of the work and hobbies he does, and has done, in and out of the church to fulfill his calling as a believer. His vocation, he explained; is to use the gifts, the talents, the resources, and the life God has given him, to respond to Jesus’ call to follow him. We all have a vocation to follow Christ. We all need to hear God’s calling and know God’s equipping by the Holy Spirit. We all are called today. How are we hearing? How are we responding? In my CPM work with those in inquiry and candidacy there are a lot of conversations about vocation, calling and spiritual formation. Working with COM has given me the opportunity to explore those same dynamics with churches, Ruling Elders and Teaching Elders. Outside of work I’m privileged to serve as chaplain to the board of Renewal Ministries Northwest, an organization seeking to equip churches and church leaders to deepen church member’s walk with Christ, and assisting churches in being more faithful. In November these questions of vocation and all these roles in my life intersect with a wonderful (and inexpensive) teaching retreat, right here in Seattle. 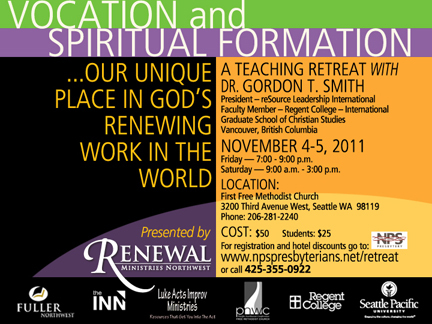 The retreat, lead by Dr. Gordon Smith, sponsored by Renewal Ministries Northwest, “Vocation and Spiritual Formation; …Our Unique Place in God’s Renewing Work in the World” will be held, Friday, Nov. 4, 2011, 7pm - 9pm Saturday, Nov. 5, 2011, 9am - 3pm, at First Free Methodist Church, Seattle, WA. This is the perfect opportunity for any believer discerning their call to ministry. Since all believers are called to ministry, I believe that includes all of us. So, if you are examining what God is calling you do to next in ministry, whether that is helping in Christian Education, cooking for a food program, going to seminary, exploring the mission of the church you lead as a Ruling Elder, or looking at a pipefitting apprenticeship program; this is the retreat for you. Especially if you are considering just what God has for you next, this is a great opportunity for you. Registration is simple - click here! By listening with “the ear of the heart,” we will seek to deepen our relationship with our Trinitarian God — God for us, God with us, God in us — through reading, reflection on the art and relevant Scripture texts, and journaling our prayer response. Rev. M. Louise Holert. Louise has served as a special term missionary teacher, Christian education director, associate pastor and also as an associate director of a ministry to international students. She has graduate degrees in Christian Education, Theology, and Missiology, along with a certificate in Spiritual Formation. Louise has led a number of “Praying with the Arts” retreats over the past several years. Her passion is helping others nurture intimacy with God through the arts.